There are lots of reasons why women don’t want to become involved in Mary Kay Cosmetics. The recruiter’s job is to overcome those objections. She is given standard lines, like the below, to use to convince you to join. If you’ve ever been in Mary Kay, you know these responses are filled with lies. 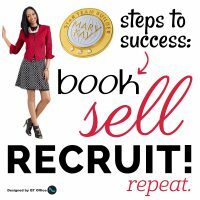 You DO have to sell to succeed in Mary Kay. The products do NOT sell themselves. You WILL have to talk to strangers. You will NOT be able to turn one person into an entire customer base. You will NOT be able to earn $100 with only 3 hours of work. I don’t have any problem with the basic concept of overcoming objections… it’s done in almost every sales job. What I have a problem with is lying. If I could teach you how to earn an extra $100 per week — that’s $400 per month — working 3 hours a week, and eventually double that to $200 per week, could you find 3 hours? card? If I could show you how to earn your $100 back in 2 weeks, could you find someone to help get you started? Would you believe that probably 90% of the women who start Mary Kay are not the sales type? (yes) If I could teach you how to show this product and let it sell itself, without being pushy, would you feel better about doing it? Do you believe that women love to take care of their skin with great products? (yes) If I could teach you how to help them do that, rather than trying to SELL them something, would you feel better about doing it? What was the first thing I said before I showed the sets at your class? (You’re not under any obligation to buy anything) Did you feel that I was being pushy? Did you know I sold $___ at that class? Women love to shop! Do you know one person who might be a practice face for you? (yes) If I can teach you how to turn that one person into all the other faces you will ever need, would you be willing to learn? Do you know that many of our most successful consultants didn’t start with people they knew? If I can teach you how to meet people, would you be excited about a Mary Kay business? Do you feel skin care is important? (yes — if she says no, you probably don’t want to recruit her) Would you be surprised to learn that the majority of products we sell are skin care and body care, rather than makeup? Would you be surprised to learn that many of our most successful consultants and Directors don’t really wear a lot of makeup — but they are committed to good skin care? Would you be surprised to learn that the majority of your Mary Kay income will come from women buying skin care and body care, rather than makeup? be excited to give it a try? What will your husband say? Would you agree with me that we can pretty much get our husbands to let us do whatever we want, as long as they know it is important to us? Just let him know it is important to you! Would it surprise you to know that some of our most successful consultants were extremely shy when they started their businesses, and they have done very well? Would you like to be less shy? Can you see the value of doing something that is fun and might bring you out of your shyness AND earn you money in the process? Would it surprise you to know that most shy people are very sincere, and sincerity is one of the best qualities a Mary Kay consultant can possess? Would you agree with me that there is probably someone in every single occupation on earth that hasn’t done well while other did? (yes) So what makes you think you wouldn’t do well? Would you agree that her lack of success might have more to do with her personal situation than with Mary Kay? Let me ask you a question. Have you ever worked with someone at your job who failed or quit? (yes) Did her quitting keep YOU from being successfully at YOUR job? (no) The same is true of Mary Kay. We each have our own opportunity. It is not dependent on others. (In a soft voice) May I ask you a question? (yes) Do you think you’re just scared? (yes) Well, what’s the very worst thing that could happen to you? (wait for her response, then say) Do you want to know what I think? (yes) I think the very worst thing that could happen to you is you save 50% on your products for the rest of your life — does that scare you? I totally understand. I felt that way myself, but here’s what I’ve found. We’re all scared when we start something new, but what’s the worst thing that could happen to you (wait for her answer) And what’s the best thing that could happen to you? ‘Would it surprise you to know….’ is the big red flag. Yes. It would surprise me, because I’ve seen ZERO evidence to back up your outrageous claims. Show me your Schedule C, show me an actual accounting of your time spinning your wheels, show me the truth… the PINK TRUTH! No one ever calls them out on this. They don’t teach, they don’t show how, and they don’t keep their promises. Oh boy do you NOT want my answer to that. Thousands of dollars of debt, broken marriage, children who hate you, home repossessed, family who won’t speak to you, friends who no longer associate with you, your professional career down the toilet…I could go on. All of their statements start with “if”…. if doesn’t mean ‘will’ or ‘am able to’…. a bunch of empty promises. When I joined in the early 90’s – my MIL recruited me… you would think that she as a Sr. SD would have plenty of knowledge and skill to pass on- but at the point she had recruited me- she hadn’t held a class for a very long time- only facials… so her “teaching” consisted of me reading/ filling out the New Consultant Workbooks- and reading my flip chart. She also ran a training center – and said that’s where I would learn hands on stuff – not really true… just a lot of fluff to regurgitate, no real training. Reminds me of hearing Pam Shaw lecture us about selling and recruiting more but then her husband admitting she hadn’t held appointments in a very long time. Let’s play a game! How would an SD answer the following objections? 1) I hate Mary Kay and everything it stands for. 2) Everyone I’ve ever met who joins an MLM, er “direct marketing” company becomes a sad pathetic annoying person who apparently depends on her friends to pay her bills. 3) I only like quality makeup, not marked-up-for-the-upline drugstore stuff. 4) Is there a reason you are still talking? This is Michelle, spelled my name wrong, duh. Great game, Michelle! I will definitely remember that when I’m approached by someone with MKCrap. Recently I had someone approach me with the “you’re skin looks amazing what do you do?” So i told her. She then told me that using natural products will not prevent aging and that the Timewise 3d would work wonders. I said how old do you think I am? She said “23-25” I said “well obviously my routine is working for anti-aging, considering I am 36. This conversation is over”. I’ve had the SAME experience frequently – I am 56 and regularly get told I look 45 – so that Timewise crap can just stay off my face! Same here. Best skin I’ve ever had is now. And I’m not spending $35 wholesale for 4 sheet masks, either! The worst is the decades of lies. Over priced products. No where to advertise and a saturated market. Many women now know that this is an mlm. I hate being asked to any of these predatory scams. Amway, tupperware, discovery toys, herbalife, melaleuca, nu skin, shaklee, the pampered chef etc. I also resented the stupid: Do this scheme part time and earn full time income. Ya…right. From the Washington Post. Please copy and paste into your browser. Jeunesse, another MLM, also being sued under a class action lawsuit by distributors for being a pyramid scheme. Jeunesse also recently settled and PAID in another suit. Is Mary Kay a scam? MLM-ing is the act of scamming, not the name of the company or product. I hope they keep up the pressure with all these class actions and keep tightening the noose around the MLM-ing companies’ necks.